ACS students found themselves immersed in many activities that helped to bring the days leading up to Easter into focus. The week included lessons on pysanky, the art of Ukrainian egg dying for older students and traditional Easter egg decorating for the younger students. Discussions took place in classrooms based on the last week of Christ’s life. 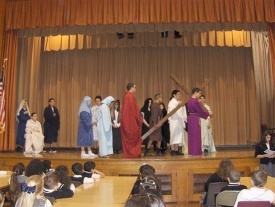 On Holy Thursday the classes of 2009, 2010, and 2011 presented the Living Stations of the Cross to the school. This was followed by spiritual activities back in the classrooms. The school week culminated with students, parents, and parishioners participating in Good Friday services at Church led by Father Roman. Sub-deacon Paul Makar congratulated Sister Yosaphata on the beautiful chanting that students provided for the services. Over twenty – five altar boys and members of Sodality also kept vigil at Our Lord’s grave throughout the afternoon and into Holy Saturday.